Respiratory infection season is here! This means lots of colds, especially in daycare- and preschool-aged children. And that leads to the worry of a cold or viral upper respiratory tract infection (URI) becoming a bacterial sinusitis. How do you know if the runny nose and cough is from a cold or from a sinus infection? Any cold can generate symptoms of nasal congestion, nasal discharge (of different colors and thickness), cough and post nasal drip. These URIs run their course in 7-10 days. (Keep in mind that the next cold can occur in a few weeks). If symptoms persist, especially fever and irritability, beyond 10 days then the child should be evaluated for a sinus infection. With a sinus infection older children may complain of facial pain or a headache. Young children may exhibit behavior problems or irritability as a sign of headache. Let’s start with a little anatomy to understand the nose and sinuses. Children are born with sinuses behind the cheeks (maxillary) and sinuses between the eyes (ethmoid). 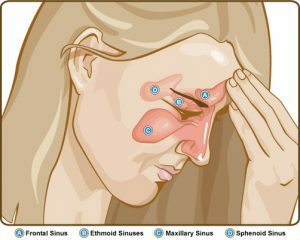 At about age 3 a sinus begins to form behind the nose (sphenoid) and at about 7 the forehead (frontal) sinuses begin to develop. All of the sinuses grow in size until midlate adolescence. The nasal cavity is connected to each of the sinuses via small drainage pathways and they all share the same kind of lining (mucosa). The nose and sinuses both create mucus in small amounts throughout the day. The drainage pathway from the sinus into the nose must stay open to keep the sinuses healthy. So how does a cold become a sinus infection? A viral URI causes the nasal mucosa to swell and increases the amount of mucus produced. This swelling can block the small drainage pathways from the sinuses, so that mucus is trapped inside. In addition, the virus can damage or injure the very important protective lining which works along with the immune system to prevent infection. When that happens, bacteria which might normally live in our nose “in peace” can “invade” the sinus cavity causing a bacterial sinusitis. The bacteria also thrive on the excess mucus in the nose. If it is a sinus infection, how should it be treated? antibiotic choice will be directed at these bacteria (very similar to ear infection treatment). Unless the child has known environmental allergy, we do not recommend allergy medications. Oral decongestants such as pseudoephedrine (Sudafed) are not recommended for children. If the child has trouble sleeping due to the nasal congestion, then it is OK to use a topical nasal decongestant such as oxymetazoline (Afrin), but only for two or three days. What if the sinus infections keep coming back? Children often get recurrent URIs during the winter season and these colds are likely to be “shared” with the family and passed back and forth. When a child has a rapid recurrence of sinusitis, then a broader-spectrum antibiotic is used, classically for three weeks. In addition to routine nasal saline rinses the doctor may prescribe an intranasal corticosteroid spray. If the sinusitis occurs multiple times and extends beyond the winter months, then it is appropriate to assess the child for causes other than recurrent colds. Although there are a host of considerations, the most common causes of recurrent sinusitis are underlying allergy, or the adenoids being enlarged and blocking the back of the nose or being infected. At this point the primary care physician will generally refer you to an otolaryngologist (ENT) or an allergist for further assessment. Remember — good handwashing, covering a cough with the elbow and routine use of nasal saline are all helpful in reducing the spread of infection. Dr. Seth Pransky is a Pediatric Otolaryngologist at Pediatric Specialty Partners. Previously the Director of Pediatric Otolaryngology at Rady Children’s Hospital for 20 years, he is an expert in pediatric ear disease and sinus problems, complex airway and voice abnormalities and sleep apnea in children. He trained at the Washington University School of Medicine, the University of Pennsylvania, and National Children’s Hospital in DC. His new private practice office is in the La Jolla Medical and Surgical Center, at 8929 University Center Lane, Suite 208. Families can call for an appointment at (858) 625-0809 or through the Pediatric Specialty Partners website: pediatricspecialtypartners.com.